Photo by Paul Sabelman via flickr. Cabs to or from the Fest cost the meter rate, or $7 per person, whichever is higher. Meter rate from Downtown or the Quarter is usually around $10-20. Cost from the Garden District will be a little more. The city will have two taxi cab stands set up near the Fair Grounds. One is at Stallings Playground, on the corner of Gentilly Boulevard and Lapeyrouse Street, and the other is at Fortier Park at Esplanade Avenue and Mystery Street. There will also be a pedicab stand next to the taxis on Esplanade and Mystery. Expect 10-30 minute lines on most days to get a cab when Fest lets out but sometimes much longer on really crowded days. Taxi Tip: The Esplanade cab stand seems slightly better organized. If you're a small group -1 or 2- listen for calls for "quarter or downtown?" as you near the front of the line and be ready to step up, as they try to fill empty seats in cabs heading to the downtown area. 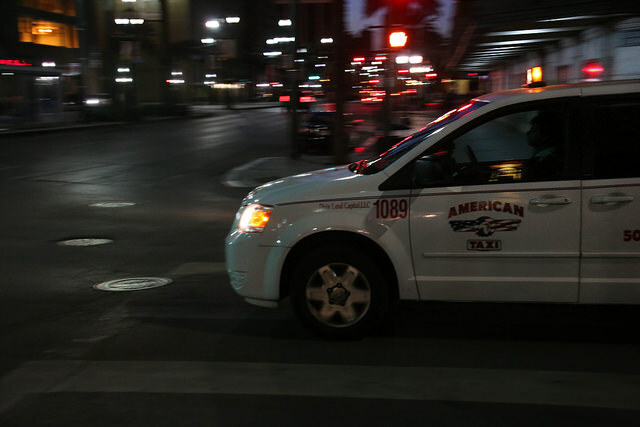 These popular ridesharing apps operate in and around New Orleans. The base, non-surge, rates to the Fairgrounds should be 30-50% lower than a metered taxi ride. Leaving Jazz Fest at the end of the day, expect that cars will be in high demand and surge rates will be high. Leave early or stay late to avoid the surges. Ubers and Lyfts will be able to drop you off right at your hotel. North Broad Street and Esplanade Avenue. Esplanade Avenue and North Carrollton Avenue. Desaix Boulevard near Tunica Street. Safety Tip: Uber and Lyft are convenient, but festival-goers using ride-share should be careful. The city has seen a string of incidents in recent months in which drivers posing as ride-share drivers have victimized unsuspecting riders. Double-check that the arriving driver and vehicle match the information that pops up in the app. Once the ride is booked, the app will display the appointed driver's photograph, a picture of the vehicle, and the vehicle's make, model and license plate. Check to make sure that what the phone says is what you see in real life. Never get into a car whose driver hails you from the street! The festival express shuttle bus, run by Gray Line, cost $19 roundtrip per person or $15 from City Park location. One way tickets back to downtown are sold at the Fairgrounds for around $1. They do not sell one way tickets going to the Fairgrounds. Photo by Prayitno via flickr. The Canal Street Streetcar will get you to Jazz Fest. The Canal Street Streetcar, line #47, runs from the Mississippi River up Canal Street, with one spur that terminates at Beauregard Circle, at the edge of City Park, walking distance, 0.7 miles, to the Fairgrounds. Streetcars tend to be slow, but if you have the time, this is a uniquely New Orleans way to get to the Fest. Expect about a 30 minute ride from Canal & the River. Heading to Fest, make sure you get on the red streetcar labeled City Park/Museum, or ask the driver if you're unsure. On the return from City Park, all streetcars go back downtown. Fare is $1.25 each way. Schedules are here (It's route #48; the Fest stop is labeled "Museum of Art "). On Fest days, the RTA supplements the Canal streetcars with bus service that follows the streetcar line up Canal, from the River. Unlike the streetcar, which terminates at City Park, the Canal buses turn onto Esplanade and drop a few blocks closer to Fest. Heading to Fest, these buses run along the steetcar tracks on the neutral ground center island of Canal St. Board the bus at any streetcar stop. See the yellow line on the map for the route. Coming home from Fest, make sure you get on the correct bus. The line that runs down Canal should be labeled 48; the one running on Esplanade/Rampart will say 91. Ask the dispatcher or driver if you're unsure. Fare for either bus is $1.25 (coins or bills) each way. Only VIP's with pre-purchased parking, or handicapped, state-issued plates or id required are able to park at the Fairgrounds. Cost for 2017 was $75/day, and it must be purchased for the whole weekend, along with your VIP ticket. For street parking, try to arrive early and just keep looking. Expect to end up about a half mile from the entrance or farther. Note that it's illegal to park within about a car length of a crosswalk, which means about 30 feet from the corner. Most corners have this space marked with a painted diagonal line, but even if there's no line or sign, it's still illegal and your car will be towed. Do not block driveways or fire hydrants! Tow trucks are out in force during the Festival!!! If you are parked illegally, you can count on being be both ticketed and towed. If you are towed, any cab driver will be able to take you to your car. Just tell them to take you to the city impound lot. The cost of the tow plus the ticket is around $200. Another option is to pay to park in a driveway or lot in the surrounding neighborhoods. Many schools, churches, and private citizens rent their spots to raise money. Expect to pay about $20-40. Photo by Theodore Lee via flickr. A great option, if you have access to a bicycle. It's about a 3 mile ride from the French Quarter, and there are bicycle corrals at both the Gentilly and Sauvage entrances. Bring your own lock! Some local shops rent bicycles, expect to pay about $25-35/day, cheaper for multi-day rentals. For longer stays, it may be cheaper to just buy a cheap bike -think Walmart- and leave it behind at the end of your trip. Bike thefts are common, so make sure you have a strong lock. Blue Bike is also new in town, and a great way to get around! Most people do enough walking during a day of Jazz Fest that they're not wanting any extra time on their feet. But others do enjoy the walk to or from Fest. It's anywhere between 1.6 and 3 miles from the Quarter, depending where exactly you're starting from. We recommend walking on Esplanade St to Dupre St., then head right towards the Fest- there will be enough others walking, biking, and driving on that route to make it a pretty safe walk. If you are one of the thousands of people attending New Orleans Jazz and Heritage Festival, you’re going to need to find a way to get there. With so many people in one place, the logistics of festival-going can be chaotic, so we’ve put together a list of tips to help you travel safely to your destination, and safely home! In order to help you experience and understand New Orleans Jazz and Heritage Festival in the best way possible, we've put together an Astrid Solo Travel Advisor Jazz Fest Guide with all the information on the basic things you need to know!